Extrusion molding is another method of manufacturing plastic pvc hose components. Extrusion molding is very similar ¬¬to injection molding and is used to make pipes, tubes, straws, pvc hoses and other hollow pieces. Plastic resin is fed into a barrel where it is liquefied. A rotating screw propels the liquefied plastic into a mold, which contains a tube-shaped orifice. 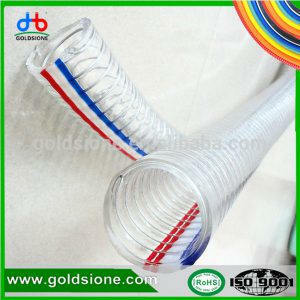 The size and shape of the pvc hoses determines the size and shape of the pvc hose piece. The liquefied plastic then cools and is fed through an extruder, which flattens the plastic and forms the piece into its final shape.